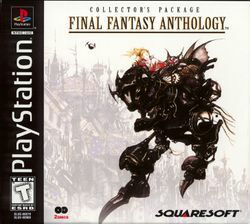 Final Fantasy Anthology is a compilation of two Square console RPGs remade and re-released for the Sony PlayStation. The North American release replaces Final Fantasy IV with Final Fantasy VI. This page was last edited on 4 April 2016, at 17:32.